Pulmonary embolism is a sudden blockage in a lung artery, usually caused by a blood clot that moves into the lung from a vein in the leg. Technically, pulmonary embolism is not a disease. It’s a complication of deep vein thrombosis, when blood clots from in the body’s deep veins (usually in the legs). The Centers for Disease Control and Prevention says it’s difficult to assess precisely the number of people affected by pulmonary embolism and deep vein thrombosis, but it estimates as many as 900,000 (1 to 2 per 1,000) each year in the United States. Of that number, an estimated 60,000 to 100,000 die from DVT/PE, also known as venous thromboembolism. Pulmonary embolism can damage areas of your lung because of reduced blood flow to lung tissue and cause reduced oxygen levels in your blood that can also damage other organs. A large clot, or multiple clots, can cause death. The clot’s size and location in the lung greatly affect your symptoms. Shortness of breath, either sudden or progressive, is the most common sign of pulmonary embolism. Increased sensation of warmth in the swollen area. This condition starts as deep vein thrombosis, a blood clot in a deep vein of the leg or pelvis. When a clot breaks away and moves, via the bloodstream, to the lung and blocks an artery, it becomes a pulmonary embolism. Why do blood clots form in the leg? If your movement is restricted for long periods, your blood flow is also restricted and slows. You’re vulnerable if bedridden, after certain surgeries and during long trips with restricted movement in a car or plane. Family history of embolisms, deep vein thrombosis. Diagnosing a pulmonary embolism can be challenging. Your doctor will first review your overall health and pre-existing conditions. It’s often a doctor in the emergency department, with assistance from a radiologist (X-rays), who diagnoses pulmonary embolism. During a physical exam, the doctor will look for indicators of deep vein thrombosis while also checking your blood pressure, heart and lungs. An ultrasound, which uses sound waves to examine blood flow, can help identify blood clots in your leg. 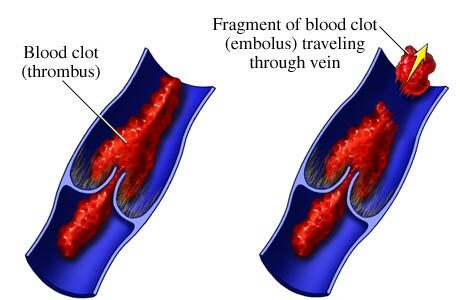 A CT (computed tomography) scan, which uses a dye injected into a vein in your arm to make blood vessels visible on X-ray images, also might reveal blood clots in your legs and lungs. If identified early enough, with a clot small enough, your doctor will prescribe medication that can break up small clots. Anticoagulants, also known as blood thinners, make clotting more difficult. They also prevent clots from getting bigger. They will not, however, eliminate existing clots – in time, the body dissolves most clots. Blood thinners are available as a pill, through an injection or intravenously. Coumadin, a brand name for warfarin, is a familiar pill-form blood thinner. If you end up in a hospital or emergency department with a life-threatening pulmonary embolism, doctors might try to dissolve a blot clot with thrombolytics. These medications are only used under such emergency circumstances because they can sudden, dangerous bleeding. Surgery is seldom needed to remove a blood clot. If it is, your doctor can use a vein filter installed in your inferior vena cava – the main vein that extends from your legs to the right side of your heart --- to prevent a clot from reaching your lungs.